Addressing the elements of reliability using a new and creative approach for the first time in one source, this book is intended to simplify the assessment of reliability by first identifying the current expectations then assessing the current practices to determine if expectations are realistic or if they are not supported by programs and practices. It combines the most effective and efficient of those approaches into a single activity that shows managers what they have a right to expect and what they do not. Most often, this discovery comes as the result of painful failures and production losses. This unique book and the process it describes will allow the discovery of this misalignment to take place at a more convenient and less costly time. Designed to be easy to read, this resource is perfect for busy people who have little time for long and tedious texts or courses that take them away from their workplace. Reliability Engineers, Maintenance and Reliability Managers, Engineering Managers, Plant and Corporate Senior Staff and Executives looking ways to enhance performance, and Consultants who may want to enrich their portfolio by adding this tool will all benefit from the information found in this resource. 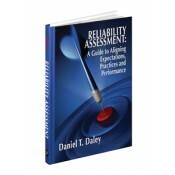 • Provides the reader with a clear description of the overall concept of Aligning Reliability Expectations. • Contains both simple examples and the methodology needed to determine if the programs at each step during the lifecycle of a plant or system will adequately create or maintain reliability. • Describes how to organize a Wide-Hart assessment. • Describes how to conduct a Wide-Hart assessment. • Describes how to communicate results of a Wide-Hart assessment. • Describes steps in organizing for correcting weaknesses found during the Wide-Hart assessment. • Contains the Control Document for organizing the assessment and corrective action and the Assessment form for organizing results from assessment and describing results.